A veteran Russian space station commander, a rookie cosmonaut and a NASA shuttle flier rocketed smoothly into space aboard a Russian Soyuz ferry craft Tuesday, but the crew ran into problems executing a required rendezvous rocket firing, delaying docking with the International Space Station until Thursday at the earliest. Soyuz TMA-12M commander Alexander Skvortsov, flight engineer Oleg Artemyev and NASA astronaut Steven Swanson lifted off from the Baikonur Cosmodrome in Kazakhstan at 5:17 p.m. EDT (GMT-4; 3:17 a.m. Wednesday local time), kicking off a planned four-orbit six-hour rendezvous with the station. The fast-track rendezvous procedure replaced a more traditional two-day approach to the lab complex that Soyuz crews followed for most of the 15-year lifetime of the space station. Only four previous crewed missions to the outpost used the four-orbit procedure and flight controllers always hold the two-day profile in reserve if needed. Skvortsov and his crewmates had hoped to be the fifth crew to carry out a four-orbit rendezvous. They executed the first two rendezvous firings on schedule, but the third firing was not carried out, apparently because the spacecraft was not in the expected attitude, or orientation. With the rendezvous sequence interrupted, Russian flight controllers defaulted to the more traditional two-day sequence while engineers reviewed telemetry and stood by for additional passes over Russian ground stations to collect more data. "Right now, we don't understand exactly what happened," a Russian flight controller radioed the crew. "So we'll analyze and review all the telemetry. On the next orbit, there will be a comm pass. ... During this comm pass, we'll download the whole mass of telemetry and we will analyze it and review it and we'll try to figure out what happened." The two-day rendezvous profile will be familiar to Skvortsov, who followed the same set of procedures during his first flight to the space station in 2010. Assuming the problem can be resolved in time, Skvortsov will oversee an automated docking at the station's upper Poisk module around 7:58 p.m. Thursday. Josh Byerly, NASA's mission control commentator, said the crew was in no danger, and that more than enough supplies were on board to support a two-day 34-orbit rendezvous. Whenever they arrive, Skvortsov and his crewmates will be welcomed aboard the space station by Expedition 39 commander Koichi Wakata, cosmonaut Mikhail Tyurin and NASA astronaut Rick Mastracchio. Wakata and his two crewmates have had the station to themselves since March 11 when Soyuz TMA-10M commander Oleg Kotov, Sergey Ryazanskiy and Mike Hopkins returned to Earth. Wakata and his crewmates are scheduled to follow suit in their Soyuz TMA-11M ferry craft on May 13. That will clear the way for launch of Soyuz TMA-13M commander Maxim Suraev, a Russian space veteran, and two rookies: European Space Agency astronaut Alexander Gerst and NASA astronaut Reid Wiseman. The tight choreography between U.S. and Russian flight control centers to keep the space station healthy, adequately supplied and staffed with rotating international crews illustrates how dependent both sides are on each other. The Russian segment of the space station uses electricity generated by NASA solar arrays, taps into the station's computer network, uses NASA's communications satellites and relies on U.S. gyroscopes and flight controllers at the Johnson Space Center in Houston to keep the outpost properly oriented without having to use precious rocket fuel. NASA, in turn, relies on the Russians to ferry U.S. and partner astronauts to and from the station aboard Soyuz spacecraft and to provide the rocket power needed for major station maneuvers. And both sides share critical life support systems and launch uncrewed cargo ships to keep the station supplied. NASA hopes to have one or more commercially developed spacecraft capable of carrying NASA astronauts to and from the station by around 2017. 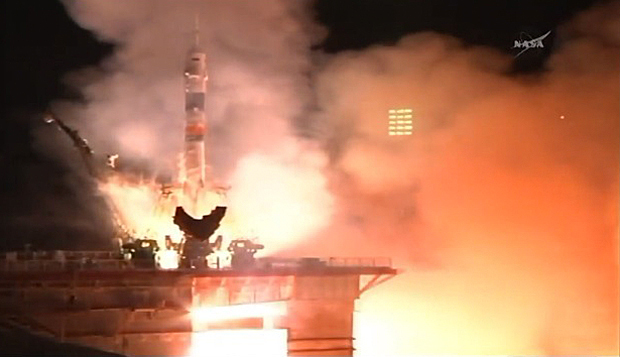 But until then, the agency must rely on the Russians, paying up to $70 million per seat aboard Soyuz spacecraft. Despite increased superpower tensions over Ukraine and Crimea, "there is this kind of mutual dependency (with the station program) that would make it not in Russia's interest to cut off our access," John Logsdon, professor emeritus of political science and international affairs at George Washington University, said in an interview. "And it's certainly not in our interest to so alienate Russia that we no longer had access to the station," he said. "So, I think the by far most likely outcome is kind of encapsulating the station from the broader political currents." In an interview last week in Houston, during training for his May flight to the space station, Wiseman downplayed the current conflict, saying "the politics starts to fall by the wayside" when working with Russian space engineers, flight controllers and cosmonauts on a daily basis. "Working with my commander and all the Russian trainers over there, these people are not just my colleagues, they're all my friends," he said. "And so sure, we don't want to see political turmoil, and it could ultimately get in the way of our spaceflight. "But from the operator standpoint looking up, this is absolutely a non issue for us," he said. "I mean, we're three really good friends climbing into a Soyuz to fly into space. All politics aside, there's no doubt it's going to work for us." While Russian President Vladimir Putin could step in at some point to block U.S. access to Soyuz flights, "it basically would be a catastrophe for the station," Logsdon said. "Cutting off U.S. access to station would be kind of a last-resort action that would reflect a total breakdown of U.S.-Russian relationships." He does not believe it will come to that. But he said the current conflict may encourage U.S. lawmakers to fully fund NASA's commercial crewed spacecraft program to ensure American access to space as soon as possible. "This sends a very clear message that the sooner we get off of depending on Russia for transportation, the better off we are," Logsdon said. "It's conceivable the White House will use some of its political clout to make sure commercial crew (program) gets fully funded." 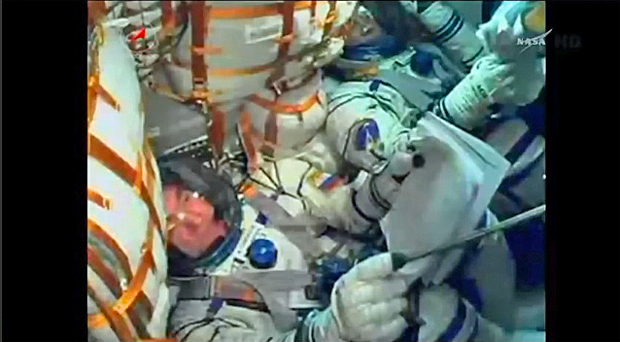 For their part, the Soyuz TMA-12M crew is focused squarely on its upcoming mission. Skvortsov spent 176 days aboard the space station in 2010, serving as a flight engineer with Expedition 23 and commander of Expedition 24. This time around, he will serve as a flight engineer throughout a planned 169-day stay, serving with the Expedition 39 and 40 crews. In a pre-flight interview, Skvortsov said his first spaceflight, and the view of Earth from orbit, changed his perspective, making him much more aware of environmental issues. "It is my firm belief that ecological problems do need addressing," he said. "Unfortunately, there are too many places where mankind is creating damage. Ecological problems ... are something all of us have in common. This planet is our home." Swanson spent 27 days in space during two shuttle missions in 2007 and 2009. He will serve as a flight engineer during the remainder of Expedition 39, taking over as commander of Expedition 40 when Wakata, Mastracchio and Tyurin depart in May. Serving as commander means "looking more at the big picture, you know, how we're going to operate as a team," Swanson said. "And then also just the consumables on board, how much oxygen, water, how all that works, keeping all that in mind and just kind of knowing what the ground is always thinking of." "I think that's kind of your job (as commander), just to be part of that whole, big team, and have that interface with the ground to make sure it's going smoothly." Swanson is a computer software expert who consider himself a scientist-engineer. He said he's particularly looking forward to operating a wide variety of experiments during his stay aboard the station. "We have over 170 experiments going on, we've been trained in a lot of them," he said. "They vary, of course, to ones we don't even touch, to ones that we are the technical operator on but we don't do anything but start them up and get them set to go. And there are ones we are the actual subjects for. "For me, the ones I'm most interested in are the ones that I'm doing. Those have to do with ocular health, what happens to your eyesight (in microgravity) and, of course, also working on muscle atrophy and bone loss." During the course of their stay aboard the station, Skvortsov, Artemyev and Swanson will oversee the arrival of three uncrewed supply ships -- one Russian Progress, an Orbital Sciences Cygnus and a SpaceX Dragon capsule. Two Russian spacewalks are planned during Expedition 40, along with two and possibly three U.S. excursions. The details are still be ironed out, but Swanson is expected to participate. "I've done four so far (during the shuttle program), I've been very privileged, I appreciate that opportunity," Swanson said. "To do it again (will) be great. "The views are amazing out there. It's hard to describe because it's so different from anything else, but just the idea of going out in your own little space vehicle and working on the station, making it better, and also just relaxing and seeing the whole Earth below you is a fantastic thing." Artemyev, the only rookie in the Soyuz TMA-12M crew, said he was eager to experience all aspects of spaceflight, especially getting a chance to live and work in the Russian Zvezda command module, which he helped build. "I've been preparing for this mission for 11 years now," he said. "Now, I'm like that horse leaving the stable who really wants to race! So I'm interested in everything that I will be doing in my new home. ... I'm anticipating seeing the service module in person, because that's the module I was working on when I was an engineer at RSC Energia." Asked what he might miss during his stay in space, Artemyev said "I can tell you for sure that the part we all miss the most is our family and being far away from family and friends and loved ones." "That's the hardest thing we do, the feeling that you cannot be with your family or, God forbid, if something happens, you cannot do something for them, you cannot be by their side," he said. "That's the hardest thing by far." Skvortsov, Swanson and Artemyev are scheduled to return to Earth on Sept. 11. Their replacements -- Barry Wilmore, Alexander Samokutyaev and Elena Serova -- are scheduled for launch Sept. 26. They will join Suraev, Gerst and Wiseman as part of the Expedition 41 crew.